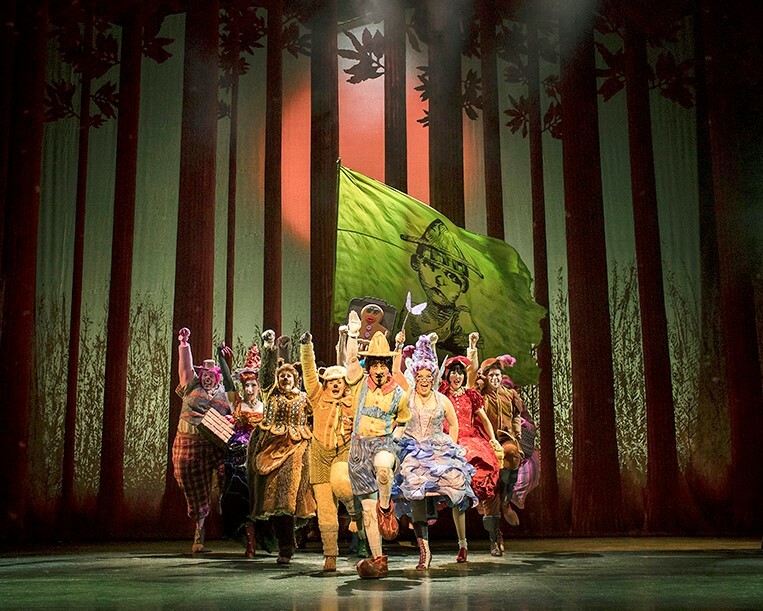 We were lucky enough to see SHREK THE MUSICAL® at The Wales Millennium Centre two years ago on its very first UK & Ireland Tour, and this week returned to the Centre to see it again on its latest tour. It was brilliant back then and the whole family loved the show, so our expectations were high beforehand that this show would be at least equal to it. 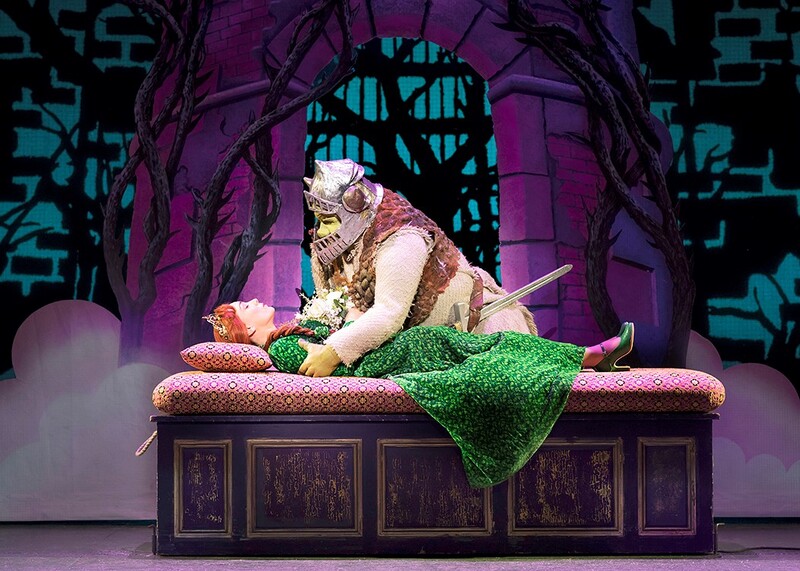 SHREK THE MUSICAL is based on the story and characters from William Steig’s book Shrek! and the Oscar®-winning DreamWorks Animations feature film. Originally directed in the West End by Jason Moore and Rob Ashford, the production has book and lyrics by David Lindsay-Abaire, music by Jeanine Tesori with multi award-winning set and costume design by Tim Hatley. 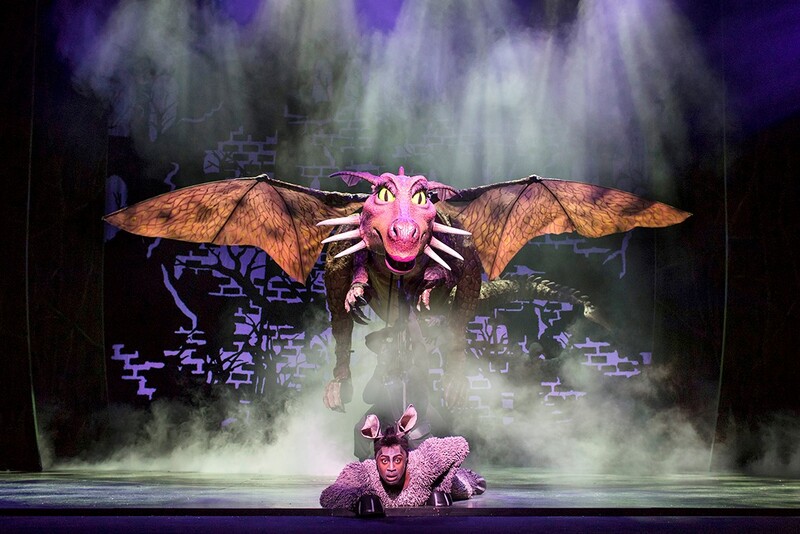 The show follows the unlikely hero Shrek and his loyal steed Donkey as they embark on a quest to rescue the beautiful (if slightly temperamental) Princess Fiona from a fire-breathing, love-sick dragon. Add the diminutive Lord Farquaad, a gang of fairytale misfits and a biscuit with attitude and you’ve got the biggest, brightest musical comedy around! Featuring all new songs as well as cult Shrek anthem I’m a Believer, SHREK THE MUSICAL brings over 100 much-loved fairytale characters, plus a 14-foot dragon, to life in an all-singing, all-dancing extravaganza. The show has also had a completely revamped storyline, which is full credit to the Director Nigel Harman for giving the show a new lease of life. On the night, Shrek was played by Michael Carolan who was outstanding. His performance was so captivating, I felt as though I could see beyond his green appearance and right into his soul. What a voice! It got me thinking that it is more difficult to convince an audience when playing serious parts throughout the show when wearing a crazy costume. Well, every actor managed to pull it off and win the audience over, so full credit to the cast. The character of ‘Donkey’ was played by Marcus Ayton, what can I say, we loved you! What a charming and funny character who was forever annoying Shrek, but their ensuing friendship and performances were so heart-warming and extremely funny. We also loved ‘Princess Fiona’, who was played by Laura Main, what an individual, quirky character she was! In summary, the show was fun, lively, easy to follow for little ones, with a few innuendos thrown in for the adults, especially by the charming yet vertically challenged Lord Farquaad! I don’t want to give his appearance away too much, but all I will say is that I don’t know how Lord Farquaad was able to stay on his knees for so long. Bravo to the actor Samuel Holmes. I feel the whole cast deserve a special mention, but as there are so many of them I will just say a huge thank you to you all for giving us a really memorable and unforgettable night.